Despite fears of an escalation in infiltration and attacks ahead of the Jammu and Kashmir assembly elections, the deployment of central paramilitary forces is set to see a 17 per cent cut as compared to the 2008 elections. This was revealed at a meeting of a core group of military, police and intelligence representatives in Srinagar on Saturday. 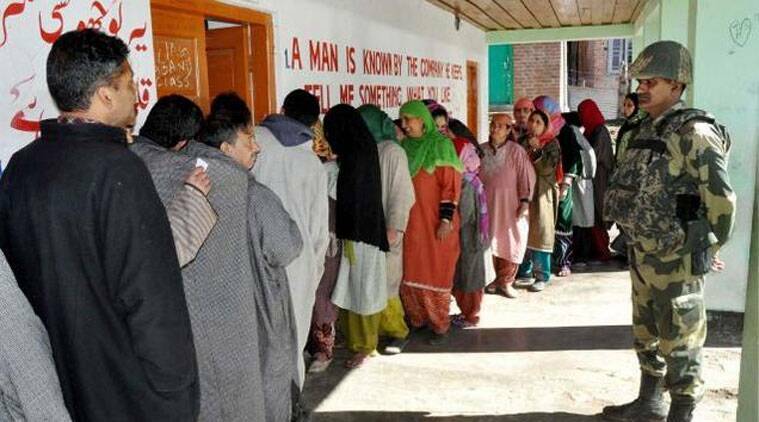 Less than 500 companies — each comprising roughly 125 personnel, including those on leave and administrative staff — will be deployed in J&K for the elections, the core group of police and military commanders was told, government sources told The Sunday Express. In 2008, when the last assembly elections were held, over 600 companies were made available, in addition to 79 companies already available within the state. The strength of central forces within the state has already been cut by 10 companies, the sources said, because of demands for additional forces from Maoist-hit states. The core group meeting, held at the Srinagar-based XV Corps’ Badami Bagh cantonment, was co-chaired by the commander of troops operating in the Kashmir zone, Lieutenant General Subrat Saha, and Director General of Police K Rajendra. According to a military source present at the meeting, force commanders were given intelligence reports that large groups of jihadists had grouped in launching positions across the Line of Control ahead of the elections. Intelligence reports presented to the commanders also spoke of efforts to coordinate infiltration between different groups, in an effort to improve the chances of penetrating India’s LoC. “It’s our assessment that efforts to breach the LoC fence will increase sharply in coming days,” a source said, “because snowfall will close the higher passes in the mountains soon”. Kashmir has seen a surge in infiltration attempts across the LoC this year — a surge which raised fears that there could be significant violence during the elections. The core group was presented data which showed 89 terrorists had been killed so far this year — significantly more than in 2012 and 2011. However, the commanders were told killings of security forces and civilians have declined, suggesting counter-terrorism operations have been effective through the year. The issue of possible largescale IED attacks was also raised, particularly on the military and police. Eight major attempts at IED attacks have been made this year, though seven failed because timely information allowed them to be defused.